The following reviews of new and classic genre movies, television series or tv-movies, books and magazines, comic books and graphic novels, video and dvd releases, cds and cd-roms, and internet sites, were written by members of this club during the years 2003 to present. If you are a member of Star Base Andromeda and would like to submit a review for consideration for this website, please contact us at the club's official e-mail account. Opinions expressed in the reviews on this website are solely those of the individual reviewer, and do not reflect the views of the membership of Star Base Andromeda as an organization. Having looked forward to this movie since I began seeing the trailers for it – “I’ll get my ball!” – I was not disappointed. This is an all-around winner, with great production values, excellent voice work and good-to-excellent animation. Though “Bolt” and “Penny” are the stars of the show, the show-stopper is “Rhino”, the over-weight, over-eager hamster. He’s a perfect blend of voice and visual characterization, supremely malleable and not just a little schizo. The story itself, aside from the whole concept of making a dog think it really has super-powers (huh? ), is fairly simple, so, it’s the journey -- literally and artistically -- that succeeds. This would be a good movie for anyone about 4 or 5 years old and older. Some parts are a little too slow-paced for the younger ones, I think. When we attended an opening day matinee there were only 3 other people, a lady and her grandkids, so it was a bit like a private screening. However, from the number of times we ourselves laughed out loud, I’m fairly certain parents and other adults will find much to enjoy along with youngsters. It’s just plain “ridonkulous”! My wife and I had the opportunity, due to a mutual day off from work, to attend an opening-day matinee showing of the new animated film Bolt. Surprisingly, the two-ish showing we caught only had a mom with two little kids in the audience, besides us! Anyway, the film was absolutely marvelous. Well written and conceived, with excellent voice work from all the principles. 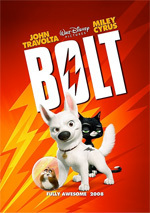 John Travolta was able to imbue Bolt the Superdog with everything from fierce determination to confusion to sadness, with equal power. Susie Essman, an unfamiliar name even though she's been working in movies and television since the late 1980s, was terrific as Mittens, grounding the film with a sense of harsh reality. However, for my money, the movie is stolen by the character of Rhino the hamster, voiced by Mark Walton. You've seen some of his best lines in the heavy promotional campaign the film has had on television -- "I'll snap his neck", "I'll get my ball", "Let it begin, let it begin!" -- but Rhino has so many fun moments in the film that I've found myself repeating his dialog and scenes over and over in my head. The movie manages to cover a lot of ground, and touch a lot of emotional bases. There's a lot of familiar stuff here -- the "incredible journey" scenario of three mismatched animals traveling cross-country on their own, and the Truman Show-like experiences that Bolt has as he realizes his reality has been manufactured for him. But a simple, adventurous storyline and the charming characters make this a movie I can't help but recommend whole-heartedly. It may be marketed primarily as a "family film" but I'm a 45-year-old male and I loved it. If you're looking for a "feel-good" film, you'll love this one too! 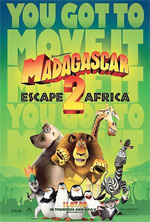 Madagascar 2 is an entertaining but ultimately unnecessary film. The original film in 2005 introduced us to all of this film's primary characters -- Alex the Lion, the "King of New York City" (Ben Stiller), Marty the Zebra (Chris Rock), Melman the hypochondriac giraffe (David Schwimmer), and Gloria the hippo (Jada Pinkett Smith). That film, essentially Marty's story, features the characters' adventures after escaping from the Central Park Zoo and getting boxed up for shipping to Africa but washing ashore in Madagascar by mistake. The new film features all the regulars, plus Sasha Baron Cohen's bizarre King Julien, and the squad of black ops penguins, attempting to fly the wreckage of a crashed plane from Madagascar back to New York. The plane manages to make it as far as the African continent before crashing. While the penguins work with some erudite monkeys to attempt to redesign and reconstruct the demolished plane, Alex, Marty, Melman and Gloria explore, discovering that they've crashed into an African wildlife preserve. This is Alex' film, as he's reunited with the parents from whom he was stolen as a cub -- his father is the "King" of the preserve. Marty connects with a herd of dozens of other zebras -- all humorously voiced by Chris Rock and leading to numerous "identity" issues. Melman's medical expertise from dealing with his own imaginary health issues leads him to becoming the local witch doctor, and Gloria feels the urge to find "the right guy" and settle down...even if that's Moto Moto, the largest male hippo of the preserve. When Alex, manipulated by one of his father's rivals, fails a rite of passage test and his exiled from the preserve, he must find a way back into his parents' good graces. Meanwhile, each of the supporting cast gets his or her own moment in the spotlight, too. This film actually felt like it had a stronger storyline (or interconnected storylines) than the original, however the sense of "freshness" wasn't there. Also, the sheer outrageousness of the first film -- the Tex Avery style of the animation -- seemed toned down for the 2nd go-around. The voice work remain top-notch, particularly Ben Stiller, Bernie Mac (as Alex' father Zuba -- one of his final film roles) and Alec Baldwin as Makunga the rival. My personal favorite characters -- the penguins -- get plenty of screen time, and lots of funny bits. But overall, this film was something of a let-down from the sense of originality that came across in the original Madagascar. It's entertaining, but it's an entertaining retread. I'll give it 2 1/2 stars out of a possible 5. Fun, but nothing to rush out to see, and it'll play well on the small screen as well as the big screen.